Does Yawning Bond Dogs with their Owners? – FIREPAW, Inc. Does Yawning Bond Dogs with their Owners? The current study examined whether contagious yawning can be observed in domestic dogs (Canis familiaris). Dogs are unusually skilled at reading human social and communicative cues. They can follow human gaze and pointing (Hare et al. 2002; Miklósi et al. 2003; Miklósi & Soproni 2006), they can show sensitivity to others’ knowledge states (e.g. indicating the location of a hidden toy more frequently to someone not involved in hiding it than to someone who did the hiding, Virányi et al. 2006) and they are even able to match their own actions to observed human actions (Topál et al. 2006). Dogs’ unique social skills in interacting with humans may be the result of selection pressures during the process of domestication (Hare & Tomasello 2005; Miklósi et al. 2003, 2007). Therefore, there is the potential that dogs may also have developed the capacity for empathy towards humans, and may catch human yawns. However, no empirical studies have been reported, which systematically investigate contagious yawning in dogs. 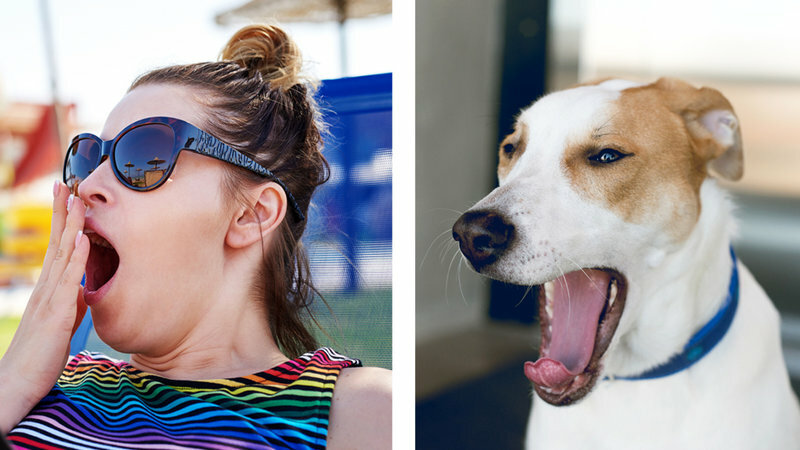 In the current study, dogs observed a human experimenter yawning (yawning condition) or demonstrating non-yawning mouth movements (control condition). If dogs have the capacity for contagious yawning, they should yawn more in the yawning condition than in the control condition.